The Outdoor Education program at the University of New Hampshire prepares students to be effective teachers and leaders in educational, recreational and therapeutic settings. Graduates pursue a variety of careers in adventure-based programs in urban, rural and backcountry landscapes. Classes are taught by faculty members who are nationally and internationally renowned for their contributions to experiential learning in outdoor settings. Students combine a liberal arts education with professional leadership development through service-learning opportunities with real clients in schools and community organizations. Outdoor education will take you out of the classroom for adventure-based learning in urban, rural and backcountry landscapes. At UNH, the outdoor education degree program combines classic liberal arts studies with courses ranging from rock climbing and sea kayaking to winter backpacking and camping. You’ll gain a solid foundation in the theories, philosophies and methods of outdoor education, while also learning essential skills in leadership and risk management through a variety of class settings. This program will prepare you for dynamic careers in areas including public and private education, adventure programming, recreation programming and environmental advocacy. Why study outdoor education at UNH? The UNH campus is the perfect setting for outdoor education. The Atlantic coast is just a few minutes away, and both the New Hampshire Lakes Region and iconic White Mountains are within an hour’s drive. There is no better place for learning and practicing your skills than amid towering mountains, atop cliffs and slabs in the state’s copious backcountry, or on the ocean. This award-winning, internationally recognized program is the oldest nationally accredited program of its kind in the United States. As an outdoor education student, you’ll build competencies through 100 days of adventure programming leadership and a 400-hour internship. Our program has 100-percent internship and employment rates. The outdoor education major is an accredited, award-winning, internationally recognized program preparing students for careers in outdoor education, adventure programming, wilderness therapy, and other educational/organizational settings. In addition to providing rich course content, this interdisciplinary program gives ample opportunity for practical application and field experience in the New Hampshire seacoast and White Mountains areas. Students must earn a grade of C (2.0) or better in every major course. In addition, they must complete 50 days of documented leadership experience prior to beginning a required internship. Interested students should contact the undergraduate coordinator, Nate Fitch, nate.fitch@unh.edu. Students in outdoor education complete KIN 650B Internship in Outdoor Education as the capstone course for the major. This course integrates the knowledge and skills learned in all previous major courses and experiences into practical applications students will use as they prepare to enter the profession. Students complete their internships at regional and national organizations upon completion of all other courses and prerequisites. The final requirement for a degree in Outdoor Education is the completion of KIN 650B Internship in Outdoor Education, which is an internship that is a minimum of 400 hours in duration. Students will typically complete this requirement after their final semester. We encourage students to seek paid professional positions to fulfill this final requirement. Often, students' internships lead directly to full-time jobs with their host organizations. Participation in one of UNH's pre-orientation programs (CONNECT, PAWS, PROVES, Marine Immersion, etc.) is a recommended experience when taking KIN 444C in the fall semester. Proof of 50 days of leadership experience is required prior to taking this course. Core of courses emphasizing the particular area or population in outdoor education of interest to student, e.g., business, education, psychology, social work (selected with the assistance of an adviser). As the oldest nationally accredited university outdoor education program in the nation, we attract students with a sincere desire to share their appreciation for the outdoors with people of all ages and abilities. We build strong teachers and leaders who can create and deliver enriching programs focused on healthy physical activities. Strong leadership and teaching skills are critical for emerging outdoor professionals. Well-designed, real-world "apprenticeship" experiences provide the best support for up-and-coming practitioners. Our students gain valuable practical skills through required leadership days, practicum experiences, and internships. Students' participation in leadership activities throughout the curriculum enhances their theoretical understanding of the field. Early in the program, students take on supported leadership roles during field-based courses. In this stage students are given "leader of the day" responsibilities that include developing a trip plan, teaching basic lessons to peers, and motivating and managing the group. As students advance through the curriculum they are introduced to local schools and organizations, planning and instructing day and weekend experiences. Later, students participate in a supervised teaching or leadership position in a community organization that ultimately leads to a culminating experience: a 400-hour internship. Outdoor education is a small program within a larger university setting, which provides students with a wealth of opportunities while also establishing strong working relationships among their peers. On-campus employment is available through the outdoor education climbing wall, the Browne Center for Innovative Learning’s youth & student programs, Campus Recreation’s Outdoor Adventures program, and many work study jobs. Students can access a wealth of outdoor resources to practice skills with nearby paddling in Great Bay, surfing at the Atlantic coats, climbing at Pawtuckaway State Park, and hiking and backpacking in the White Mountains. The curriculum is deliberately structured so students can complete minors or second majors in other subject areas, receiving valuable cross training for lifelong learning and career advantage. Each faculty is able to teach field experiences that build personalized relationships with individual students. Many students work closely with faculty on research projects and as teaching assistants, and these connections help with job placements in the future. Most field courses have a maximum class size of 8-12 students, depending on recommended ratios for the activities. Campus-based seminar courses typically range between 12- 24 students. Q: What does the typical four-year college experience look like for an Outdoor Education major? 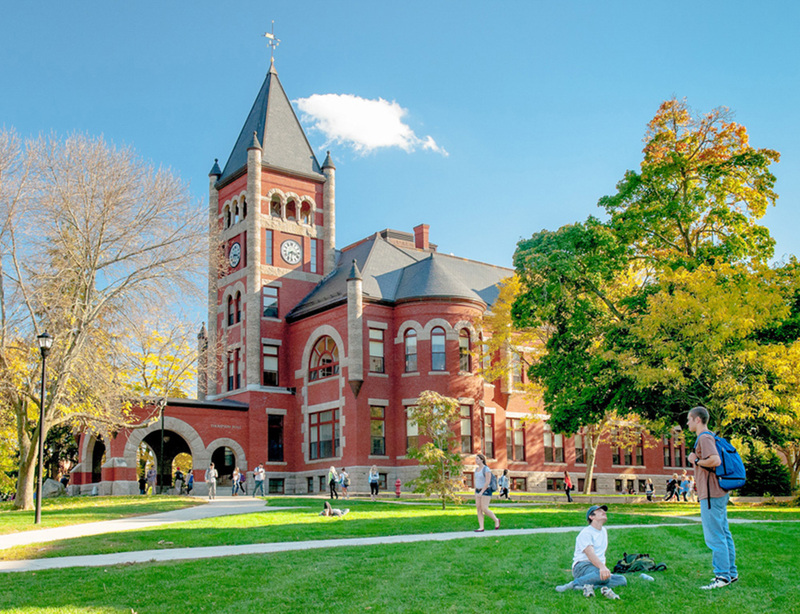 Your experience at UNH will be the co-creation of you and your academic advisor. To see one example of what your four years could look like, see our core requirements and our minor/major options pages. Q: Do Outdoor Education students participate in extended expeditions? Our extended expeditions are 6 to 10 days in length. These courses are scheduled just prior to or after the formal semester during summer or winter break. For example, the KIN 548 - Winter Expedition Programming course occurs the two weeks prior to UNH's spring semester. Skills courses scheduled during a semester involve half day and weekend trips to climbing sites, whitewater rivers, etc. Almost all of our courses have some form of field component. Students who take full advantage of the curriculum can expect to spend 100+ days learning in the outdoors. Q: Where does the field coursework take place? Most field courses take place in the Northeast. Our typical course areas include: Pawtuckaway State Park in NH, western Massachusetts and Boston Harbor, NY’s Adirondack Park, Acadia National Park in ME, the Appalachian Trail in NH, and the White Mountain National Forest. Q: Does Outdoor Education provide job placement assistance? We host an annual Outdoor Jobs Fair at UNH every February—an event run by our senior class. We typically attract 40 employers who are eager to hire students and will interview them at the event. The fair is a great opportunity for students to find summer employment that builds an excellent resume. Students may also find a suitable paid position that satisfies their internship requirement. Our philosophy is that students complete an internship at the conclusion of their academic courses, where they have the support of our internship coordinator and faculty in applying for a paid position with a three- or four-season outdoor program. The first 10 weeks of employment satisfies their internship requirement and creates a strong link between graduation and employment in the field. Q: What type of work can I do with a degree in Outdoor Education? For a look at employment among our past graduates, please see the alumni information page and check out our partial listing of past internships. Our internship philosophy is that students apply for a paid position that advances their abilities with teaching, leadership, and program administration. Many students graduate with 200+ days of documented field time represented in a strong resume. Q: Are there opportunities to study abroad in Outdoor Education? Many of our students have taken advantage of the opportunity to study abroad for academic credit in Australia, Chile, Italy, France, and New Zealand. Others have sought volunteer travel opportunities in countries like Costa Rica, India, Nepal, and Thailand. Credit is transferable from national exchange programs within the US such as Alaska and Colorado. Q: Will a NOLS course count toward the major? Many students choose to participate in NOLS courses and transfer the credits available through the University of Utah to UNH as elective credits. Some courses may count towards major requirements; however, a student and the academic advisor need to examine the course content and environmental conditions to determine if the student can waive a major requirement. A NOLS semester course offers a valuable extended backcountry experience, and it’s the pathway to future NOLS employment. Q: Will I be a certified outdoor leader? We require all students to become certified Wilderness First Responders. Interested students may also obtain canoeing and rock climbing certifications through our elective courses. Many of our courses exceed the certification standards of professional organizations. Q: Can I receive credit for my prior experiences? While students cannot receive college credits for their prior experience, some students are allowed to waive a course requirement based upon demonstrable previous experience and knowledge. Course substitutions are approved on a case-by-case basis, and students are usually encouraged to enroll in a more advanced course to substitute for the requirement. Q: What does it mean to be accredited by the Association for Experiential Education? Outdoor Education is the oldest nationally accredited university program and is required annually to file reports on its activities and policies. Please visit AEE's website to find out more about accreditation. UNH is located on the Seacoast of New Hampshire within twenty minutes of the Atlantic Ocean and 90 minutes of the White Mountain National Forest. The seacoast has easily accessible resources for the development and refinement of paddling skills, including a tidal river 5 minutes from campus. Pawtuckaway State Park, which is 20 minutes from UNH, and the White Mountains offer a variety of high quality terrain for rock climbing, ice climbing, backpacking, and paddling. The Browne Center for Innovative Learning, which has a 100+ element challenge course, is affiated with the Outdoor Education program and serves as a leadership and facilitation learning laboratory for students enrolled in Outdoor Education. Advanced students often seek employment opportunities at the Browne Center during and after their undergraduate studies. Campus Recreation offers outdoor equipment for all students to rent as well as opportunities for students to instruct short adventure experiences in rock climbing, skiing, mountain biking, hiking, canoeing, and sea kayaking. Students can work for Outdoor Adventures leading programs in all seasons. The New Hampshire Outing Club provides numerous opportunities for students to participate in day and weekend outdoor activities and later lead these programs for other UNH students. Northeast Passage is a campus-based organization that works to open up sport and adventure opportunities for individuals with physical disabilities. Many students who either have a disability or are interested in working with individuals with disabilities have worked closely with Northeast Passage personnel to learn how to adapt programs for universal accessibility. The Outdoor Education program has strong ties to numerous schools and organizations throughout the region that provide internship, employment, and educational opportunities. Here are just a few examples of the organizations students have worked with during their undergraduate studies: Great Bay Discovery Center, Longview School, Seacoast Science Center, Stratham Cooperative Middle School, On Belay, Summit Achievement Academy, and Dover Teen Center. To support lifelong learning and expand future career opportunities, all students majoring in Outdoor Education are encouraged to consider a second major or a minor. Commonly pursued areas include education, social work, recreation management & policy, business, English, psychology, or various natural sciences, although many other possibilities exist. Students can expand their understanding of recreation and event management through this joint program. It allows students to support their teaching and field leadership development in Outdoor Education with a deeper exploration of supervisory and middle-management administration. Skill with a variety of program management functions will enhance a student’s ability to function as both a field instructor and program coordinator. The culmination is an internship with an outdoor company that focuses on outdoor recreation and/or education. Outdoor Education students can also concurrently complete a social work degree. Through the joint program, students are oriented to social work practice that focuses on populations at risk, values and ethics in social systems, and social and economic justice in human services. The culmination of the two majors is an internship placement with an organization that uses outdoor or experiential philosophies in a social work setting. The double major also prepares qualified students who wish to pursue graduate education in schools of social work and other human services. Students majoring in other academic disciplines are encouraged to consider pursuing the Outdoor Adventure Leadership minor to integrate adventure activities into their primary career. The minor provides valuable teaching and leadership skills useful to fields like social work, recreation management, occupational therapy, natural resources, and more. Interested students are asked to work with an Outdoor Education faculty member to select an appropriate 21 credits of courses to meet the requirements of the Outdoor Adventur Leadership minor. Through a unique partnership with the UNH Education Department, Outdoor Education students have the option to pursue K-12 teaching certificates in a fifth year at UNH. Students interested in working in or with public schools are encouraged to consider this option, as a teaching certificate can be a tremendous career asset. By completing the required coursework and teaching internship, students can become certified as teachers for K-6 elementary education or in middle school general science. Secondary education certification is also possible, requiring considerable coursework in a subject-matter discipline. Students considering a teaching certificate should talk to their advisor as early as possible, or email Jayson Seaman for more information. Outdoor Education Program is committed to promoting a positive learning environment for its students in outdoor adventure activities. Outdoor education, by its very nature, involves students in confronting and managing multiple risks in a variety of environments. Learning to recognize and assess risk is one of the central missions of the program while recognizing that managing all risks is ultimately not possible. Students are expected to manage their own clothing and equipment, carry weight of approximately 40+ pounds over uneven terrain, prepare meals suitable for the environment, sleep in co-ed groups, and care for themselves in a variety of weather conditions, including extreme weather. They need to be able comprehend directions in challenging situations and respond appropriately to changing conditions and very real dangers. We often ask students to work collaboratively in small teams, and each student’s attitude and personal preparedness is important to the success of the educational experience. We conduct our training activities with sequential instruction and practice to deepen the knowledge, skills, and judgment of our students. We use a variety of programming sites that include mountains, inland lakes and rivers, and the seacoast area, including the Atlantic Ocean. Even the most experienced traveler is subject to environmental hazards like rock fall, fluctuating rivers, and plummeting temperatures. In some remote programming areas in the Northeast, evacuation is a complex process that may take more than a day. OE faculty, staff, and students may need to manage situations for extended periods until medical help can be obtained. The program has emergency response protocols and evacuation procedures for its programming sites. Students must recognize that even more accessible locations may require several hours to obtain assistance. We carry cell or satellite phones to our practice sites and on trips for life-threatening emergencies, but this does not guarantee reliable communication between the field sites and our program contacts at UNH. Phone communication is subject to terrain, atmospheric conditions, and battery life. Increasingly our culture has an expectation of communication, yet the river valleys and mountainous terrain in which we program can interfere with phone transmissions. We do not allow personal phone calls to students on trips in an effort to preserve the battery life of our phones, nor does the UNH base expect status reports from our faculty and staff in the field on a regular basis. Upon admission to the university students are required to complete a physical assessment and immunization record with a health care provider and to submit the information to Health Services. We recommend that OE students obtain an annual physical exam and obtain medical care as needed to be physically and emotionally prepared for our courses. We may ask students with a medical problem to obtain a medical provider’s clearance to participate in a field course or defer the course to a later date. Together we try to make sure that a student is able to handle the rigors of an experience so that we can prevent an evacuation, and we strive to adapt activities and equipment where possible. Faculty and staff are trained Emergency Medical Technicians and Wilderness First Responders who can manage medical incidents, are trained to evacuate students with more serious injuries, and can obtain additional rescue assistance if needed. In addition, our students are expected to pass the certification requirements for Wilderness First Responder as a program requirement. We carry a limited number of medications in our first aid kits. Students are asked to bring an adequate supply of over-the-counter and prescription medications. We recommend that students with medical conditions carry their own medications in an easily accessible location and know how to administer them. Students with known allergies are advised to carry two courses of epinephrine and Benadryl. Those students with corrective lens such as contacts or eyeglasses should carry a back-up set. 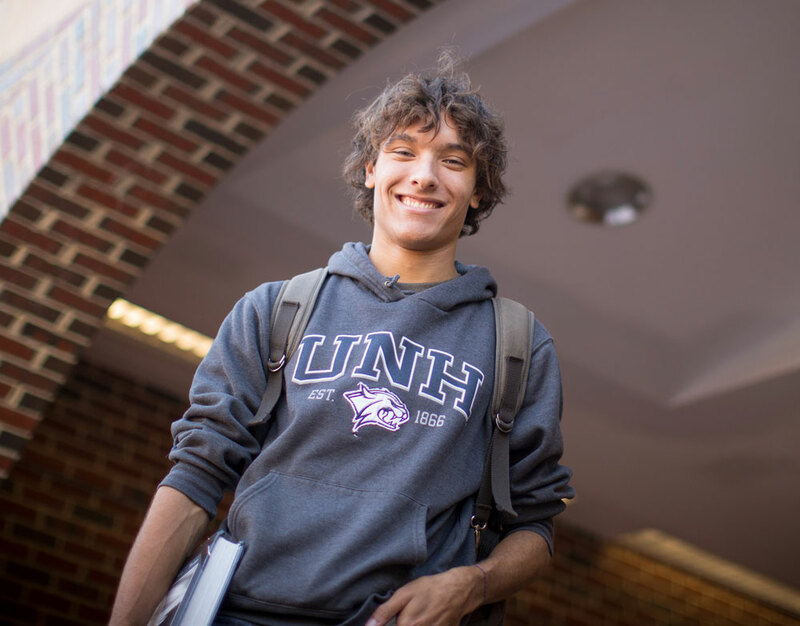 All students applying to the University of New Hampshire apply through the UNH Admissions Office. Completing an interview with the undergraduate coordinator. Filling out a transfer application. After completing the above four steps, a packet containing the transfer application, answers to the four questions, and your transcript should be submitted to Nate Fitch, Outdoor Education coordinator, in New Hampshire Hall. Application packets that are incomplete or late will not be considered. NOTE: Students wishing to transfer into the program are encouraged to take a skills class and KIN 550 — Philosophy and Methods of Outdoor Education prior to their application.